About keywords: “If you build it, he will come.” - Really? Website content competition increases. And the “safest place to hide a dead body is page 2 of the Google results!” Here is how to compete. Dear Google: We need to talk! “Why can’t I find our key products but the competition’s on Google?” - that’s the CEO speaking. Or a technician who spent three weekends tweaking her latest paper into a webpage-ready format. Your website’s own search and catalogue features, to name a few. But all of the above require an already established connection with the target audience. In order to attract additional and new online audience, and with that: potential new customers to study your new product page or conference article, search engines can generate what is called organic traffic for you. But just how can you compete with scores of already existing webpages and pdf documents for that page 1 search engine listing? According to the Real Time Statistics Project there were 3.3bio Google searches made today (13-Aug 2015, by mid-day that is). Their Internet Live Stats projects also tells us that as of today there are 3.18bio users and almost 1bio web sites. Depending on the study you look at, web content doubles around every 9-10 months and that rate is only increasing. Meaning: next year there will be 2bio websites. WebSITES that is. Multiply that with the number of pages per website and you know how much you are competing. Ok, your content only occupies a tiny topic space but this one is also increasingly competed about. And if not: nobody needs it! Just look around your competitive arena: all competitors entertain their own digital strategy and potential customers will either find their content or yours first when they search online. So, just how can you send your competitor’s web content to the second Google results page and lift yours to number 3 or 5 on page 1 without spending half of your marketing department’s budget for paid listings? Short answer: keywords supply and demand! It’s a predatory competition game, Colosseum style. Not more, not less. Search engines try to return search results (supply) to the users that are highly relevant to what the user is looking for. Next to many other search engine optimization factors that are described throughout the communications channel performance concept area as well as content creation & copy writing section, keywords (as used by the web searchers) play a vital role in this dynamic. In order for the search engines to ‘understand’ the key content of your page you need to optimize the target page and some surrounding factors with relevant keyword phrases the users will actually really use as keywords (demand). But which keywords could that be? Your technician might write her webpage content based on the terminology she uses. But is this the same terminology potential business-to-business, or b2b customers use when looking for new products or service and technical advice? The same is true for business-to-consumer, or b2c type business: when describing what should be sold online or which content should attract most visitors, what are the keywords used by that audience? There is no use to optimize a website for search engine traffic with keyword phrases that are simply not used as keywords or only rarely. To make matters worse: there might be regional or language differences which limit search engine traffic to just one part of the audience. A common example is the use of the keywords cell phone (North America), Mobile (the UK among others), Handy (German speaking countries), Smartphone (as a more generic term). But how can you know and how can you find out which keywords are popular and how they compete for audience online? You can not ask a representative number of web users as to what they punch into that search field, right? There is good news from the search engine market because the data is not only already out there but Google (and other services) also make the search behavior of the entire world available. Can you say big data? Which keywords are being used when people look for my content? How often are these keywords being used on a regular basis? How often are these terms being used in website content as keyword phrases? Which are the most attractive keyword phrases to compete for? When you talk about photography on your website would you rather use ‘photos’ or ‘images’ or ‘pictures’ to describe the product? If you decide to use ‘images’ but the majority of search engine users actually use ‘photos’ as their keywords (again: keyword demand), you will miss the majority of potential visitors. Furthermore: how are the product names combined in the searches? You might want to know whether search engine users look for ‘colored photos’ as opposed to ‘colorful photos’. Or they might combine the search with a service or value in using them like ‘royalty-free colored images’ or ‘high end framed photos’. Depending on what you are offering you don’t want to use the keyword phrases in your page copy and as navigation and anchor texts that lead to your pages, that are used less often. And finally, do you know if it makes even sense to compete? What if there are 20’000 web searches a month for a certain keyword but there are also 380mio webpages offering content for this keyword (supply)? That’s like trying to sell ice in the Arctic. Again: keywords supply and demand. Google users searched with the keyword ‘project’ 201’000 times in July 2015. But there were 1’320'000'000 webpages responding to that search. Whereas ‘project documentation’ was only used 2’000 times by web users during the same period but there were also only 635’000 webpages competing for that search keyword phrase. More detailed keywords are used less often but also find a lot less, very targeted content. While ‘project software’ is searched for 2’400 times there are almost 900’000 webpages dealing with this rather keyword phrase. However, the more detailed keyword phrase ‘project scheduling software’ finds only 58’900 webpages that deal with that content. Find the right keyword phrases that are actually used as keywords and to focus on these keyword phrases that have the best supply-demand ratio. But how can you find the right keyword phrases and obtain the supply and demand data? There are several ways to find suitable keyword phrases for your webpage content or online article and the more are used in combination the better. 1. From your own and your colleagues’ experience and from existing sales collateral and online content: create a long-list of keyword phrases in a quick internal survey. 2. Search for and research similar content with keywords that you commonly for your products or services. Pick 2-3 of the top search results and to find additional keyword phrases ideas. 3. Lookup those pages’ source code and study the title, description and keyword tags (keyword tags are not that common anymore as search engine algorithms diminish their weight dramatically for their abusive tendencies - but you might still find some and they might contain a good selection of condensed keyword phrases). 4. Use an online tool that finds keyword phrases for some analysis purpose. For example a keyword density analyzer tool. It doesn’t only help you to understand the density for your own keyword phrases (which is highly recommended for search engine optimization purposes) but it also finds and lists keyword phrases from any other webpage, like the ones you found with the above exercise. To stay with our example, the PROJECT MANAGEMENT FOR INSTRUCTIONAL DESIGNERS website features content about ‘project scheduling software’ that ranks very well in the Google search results page for that keyword phrase. It becomes quite obvious why this pages ranks highly in the search engine’s search results page as the single keywords are being used separately and in combination throughout the content and also as anchor text for inbound and outbound linking. Use this list for additional keyword phrases ideas and to learn about the keyword density because it obviously works well for that particular page. 5. To finalize and to perfect the search for keyword phrases use a keyword planner such as the one that Google offers for free within their Google Adwords service (you need to subscribe to Google Adwords). For more short lived and popular keyword planning you could use Google Trends on top. Within the Google Adwords’ Tool menu there are several keyword planner and suggestion tools where you can copy-paste a list of keyword phrases (the one that you have established by now which should be quite huge already) and have Google suggest similar keyword phrases that are frequently used as actual keywords by Google Search users. When you run this keyword suggestion routine Google produces a large list of hundreds of keyword phrasesas additional suggestions to your keyword phrases long list. Since Google is first and foremost one of the biggest data generating machine in the world you can benefit from that big data engine: next to the suggested keyword phrases the Google Adwords keyword suggestion tool provides the number of times that particular keyword phrase was used as a keyword with Google Search within a certain period of time. Delete or hide all keyword phrases that are simply not used often enough. Why would you bother? Even if you find some keyword that you really like and use all the time in the context with your business and with your colleagues: if users don’t use them often enough in their web searches they are useless for your search engine optimization efforts. Then there are the ones that are way off topic. Delete all of them or your copy writing or copy tweaking efforts might be biased towards them. It can be intriguing to add keyword phrases that are really popular and compete very well into your webpage although they have nothing to do with your message. Be brave and don’t fall victim to this trap or your website users might find your page copy and the language used too odd to trust you. Instead concentrate on the keyword phrases that make sense to you and your audience, are being used often enough and can be combined with each other. Sorry for this lengthy post, we are almost there. The demand side of the equation is complete now. In order to calculate the Keyword Competitiveness Score as seen in the graph above there is one more data point needed: the supply. Or, how many web pages did Google find and return in the search results page for a particular keyword phrase. Nothing easier than this: simply use Google Search and see how many webpages are listed for each keyword phrase. Put them into quotation marks to avoid noise and dilution. Now, as a third column in your list simply divide keyword demand by keyword supply to calculate the Keyword Competitiveness Score. 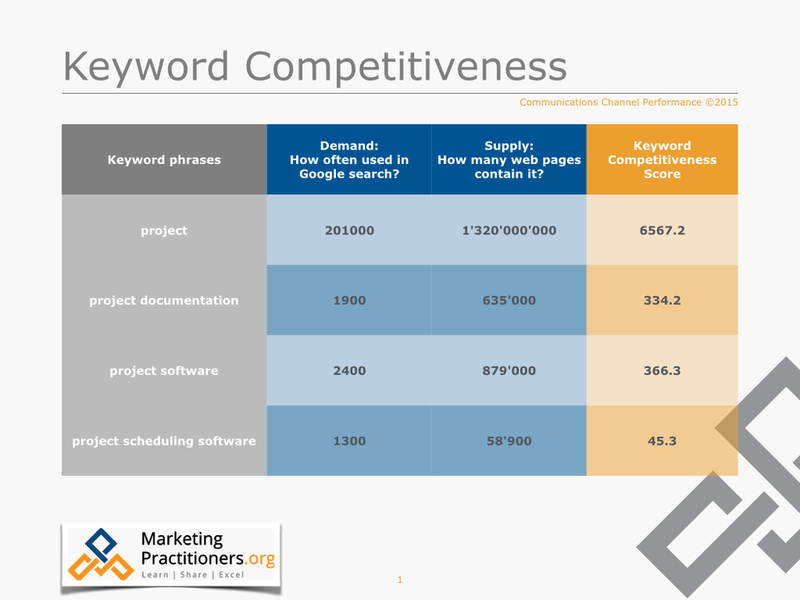 In your spreadsheet program you can now simply sort as of the lowest Keyword Competitiveness Score and work through your list to pick the most competitive keyword phrases. As described in other search engine optimization posts throughout the site and as discussed within our marketing community message boards the short listed keyword phrases should now be distributed throughout the page copy (the above mentioned keyword density tool comes in handy here again to achieve the desired keyword density) and as anchor text for site navigation, inbound links and outbound links as well as keyword phrases for social media postings. To honor integrated marketing communication principles the newly established keyword phrases and language should also be - at least in parts - adopted in print media and sales collateral. Also, the technician that was mentioned at the beginning of this post should be advised why her webpage content was edited the way it was. This is where the expertise of the professional marketer is valued and appreciated. In the end, the technician, as well as the CEO, want to find your edited and keyword-rich text on the first page of the search results! And the website readers want to find compelling and meaningful articles and blog posts, but this is another story for another day.